As part of the Masters in Transatlantic Affairs, offered jointly by The Fletcher School and the College of Europe, I have chosen to explore my interest in foreign policy, economics, and U.S.-E.U. relations in Brussels, Belgium this fall. 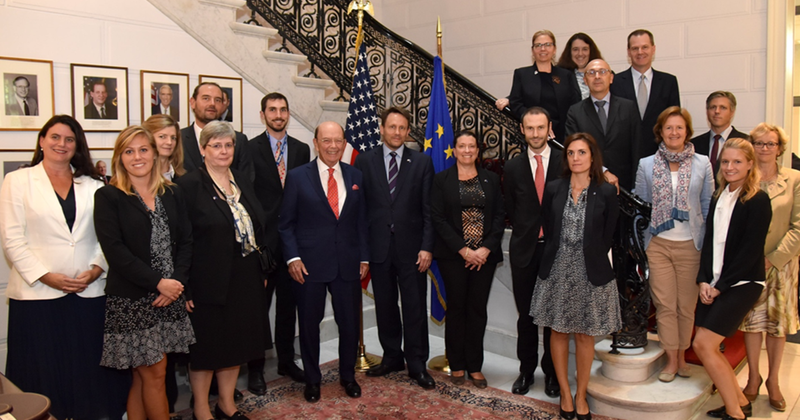 Since September, I have been a part of the Foreign Commercial Service (FCS) team at the U.S. Mission to the European Union. The FCS is the trade-promotion arm of the U.S. Department of Commerce, working out of embassies around the world in order to facilitate American exports abroad. The FCS aims to help U.S. companies plan, develop, and execute international sales strategies in order to succeed in the global marketplace. That includes providing specialized market intelligence, interpreting trade laws for a company’s needs, connecting them to foreign buyers, and/or strategizing on expanding operations into new markets. I have been impressed by the level of service Commercial Officers have shown to not only American companies, but also to the interests and policies of the United States. These Officers are diplomats at heart. I witnessed this firsthand when Wilbur Ross, the U.S. Secretary of Commerce, came to visit during my second week of work, and throughout the numerous meetings my team has held with the new U.S. Ambassador to the E.U., Gordon Sondland, to discuss economic and commercial strategy. Given my personal interest in diplomacy and foreign engagement, it has been beyond valuable to sit in the room during these meetings, helping me to better understand how issues are discussed, how protocol is followed, and how words matter. I have also enjoyed the in-depth research I have done on behalf of American firms. This has included organizing an e-commerce workshop for small- to middle-sized businesses wanting to sell their goods to European consumers online, as well as writing a white paper on upcoming procurement opportunities in the European defense sector. It is on this level that I have been able to grasp how the transatlantic relationship works in practice – from high-profile diplomatic visits to conversations with American business owners interested in the European market. I look forward to updating you on the rest of my experience soon!